- Double needle hem bottom. 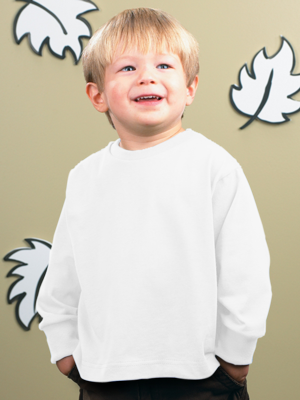 Rabbit Skins Toddler 5.5 Ounce Long Sleeve Cotton Jersey T-Shirt. Fit: Toddler Unisex. 5.5 ounce 100% cotton jersey (Heather is 90/10 cotton/polyester). White is sewn with 100% cotton thread. Ribbed collar and cuffs. Taped shoulder-to-shoulder. Double needle hem bottom. Side seam construction. EasyTear™ label. CPSIA compliant tracking label in side seam. Sizes 2, 3, 4, 5/6: White, Black, Heather, Light Blue, Navy, Orange*, Pink, Purple*, Raspberry, Red, Royal. *Colors Ship From Ball Ground, GA.